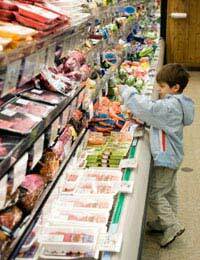 Some children will eat anything, and others just like one or two different tastes. Changing how food looks can make it more fun to eat, and might get even the fussiest child to try something new. Changing the shape of food can make it more appealing to children. Children can also help to prepare and build the food, getting them used to cooking from an early age. 1. Make sculptures or buildings using fruit or vegetables cut into flat bricks and cemented together with soft cheese, hummus, fruit spread or peanut butter. 2. Make fish cakes (mix left over cooked fish and cooked potato with beaten egg) in fish shapes. 3. Create pictures on flat breads or pancakes using nuts, seeds and dried fruit, with peanut butter or fruit spread as the glue. 4. Make spiral sandwiches – spread filling on one side of a piece of bread, soft oatcake, pancake or tortilla wrap, roll it up and slice – if using sliced bread, it may have to be pinned in place with a cocktail stick. 5. Use biscuit cutters to cut sandwiches into fun shapes, or make mini sandwiches using small crackers and cheese or ham cut to size. Cut a sandwich into interlocking puzzle shapes and mix them up – the child has to put the sandwich back together before eating it. 6. Make a salad plate into a face, with red pepper lips, tomatoes for cheeks, cucumber cut into spirals using a spiral cutter for hair and lettuce for a beard, on a bed of grated pale coloured cheese. How food tastes is all mixed up with how it looks. Try tinting food with food colouring – how do pink soft cheese, green mashed potatoes or yellow yoghurt taste? Another way to change the colour of food is to mix another food in – mash carrot or sweet potato in with potatoes, or mix fruit purée into yoghurt. Watch out for blue food though – it doesn’t always look very appetising! Using dips changes the colour of foods, and makes them more fun to eat – give children a pile of raw vegetables or cooked cold meat, pots of dips, including mayonnaise, tomato ketchup, yoghurt mixed with herbs, hummus, soft cheese or peanut butter, and things to dip with – forks, chopsticks or cocktail sticks. Dessert could be dips of fruit such as apple slices, strawberries or grapes with fruit purée, fruit spread or fruit yoghurt (or chocolate sauce as a treat). Some children don’t like vegetables, but the taste can be hidden if the vegetables are puréed – try blending vegetables into pasta sauce or soup, making home-made burgers or pizzas with lots of chopped onions and peppers, or mashing cooked vegetables in with potatoes. Children might like to try changing the taste and colour of some foods as a game – flavour plain yoghurt with strawberry but colour it yellow, or flavour potato with mint but colour it pink. Does it still taste the same?